On investigation, I found that it has been suggested that the avenues may have housed coves at one time or another, the Adam and Eve stones on the Beckhampton avenue have been included in this suggestion. I decided to take my rods and my equipment to see if I could shed some light on the subject. 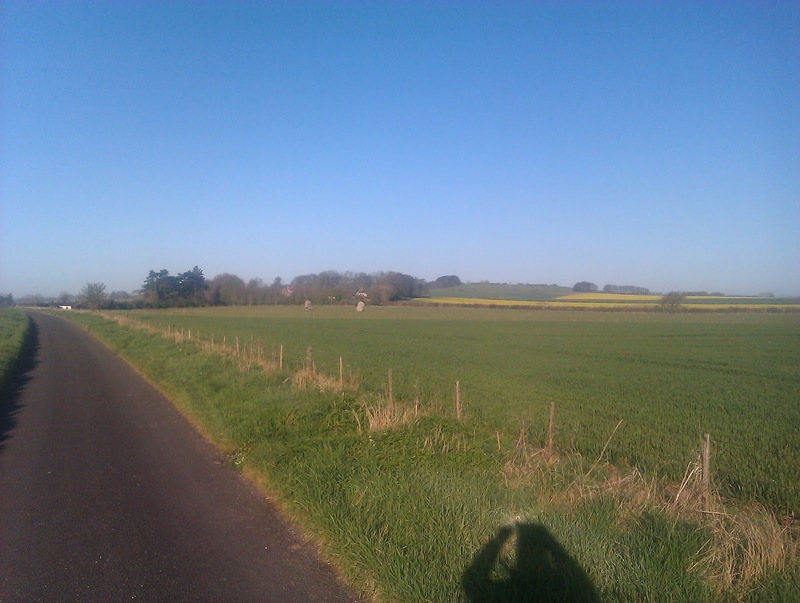 The avenue ran along-side this road, at where the stones are in the distance, the avenue curves slightly towards the left of the picture, the energy line runs in front of the stones following the avenue. 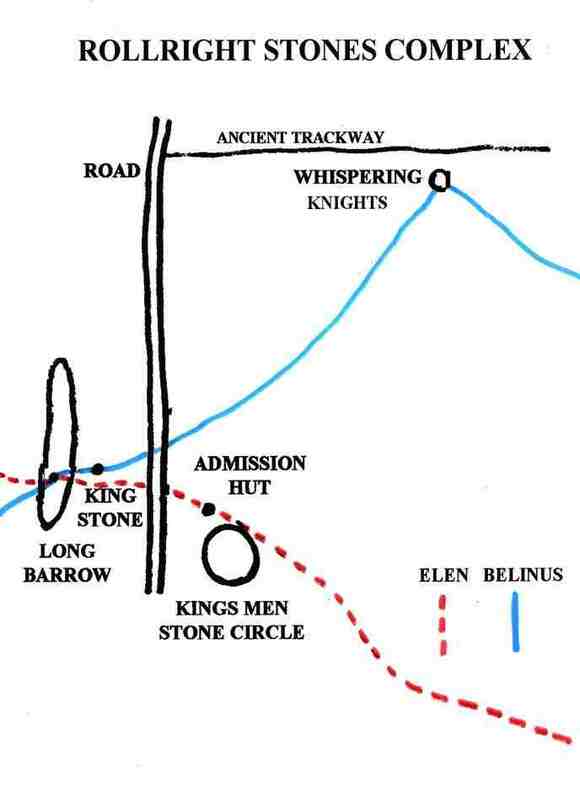 I dowsed some missing stones on this side of the energy line which confirmed that the energy line ran between the stones, as with the Kennet avenue. The first time I came here I dowsed around the stones not looking for anything in particular, Free-dowsing if you will, and I found there to be a lot of activity around the stones, I also found more energy lines other that the one I described. Unfortunatly I didnt have the time to investigate, but on this occasion I was focussed on finding the beckhampton cove/s. On looking at the stones themselves, Eve (the larger of the two) looked more like the female cove stones used in the north circle at Avebury (but smaller). 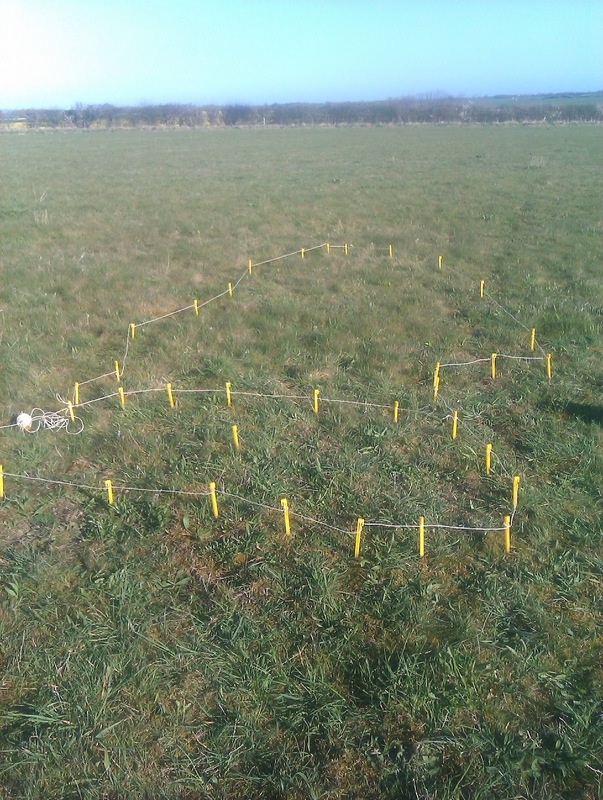 Also the gradient of the ground seemed more suspicious, from the information we have now it is difficult to tell where the missing stones may have been, but at the avebury cove the ground seems desturbed, and it seemed logical to assume that had the stones been removed in the past there may be some interference left, clues in the shape of the ground. 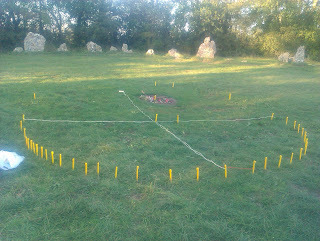 I started by dowsing in a circle around the Eve stone, asking for a cove, I got a clear yes. I asked for the point within the center of the cove, which I marked, and then the center of the two stones. I actually dowsed a fourth stone which was very small, so I discounted this but I admit it did have me confused for a while! I then dowsed for the edges of the stones, asking for the edge at ground level, I got two shapes. 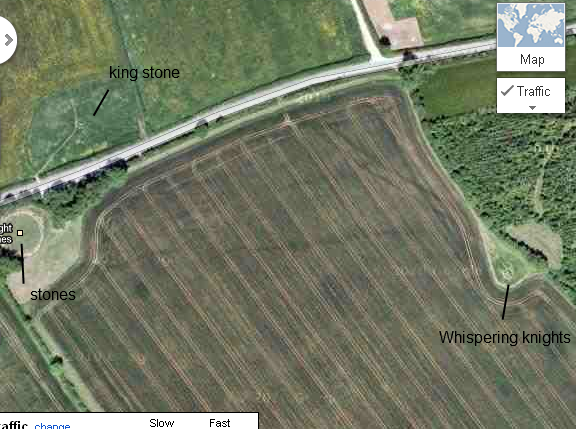 I then started again, and seemingly received the same information so I marked out the two missing stones. 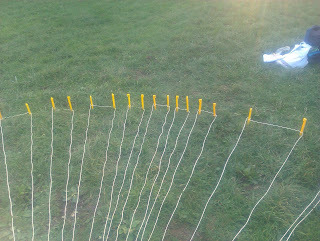 I recorded the measurements, using a tape measure. But one thing was troubling me and that was the height of the stones. 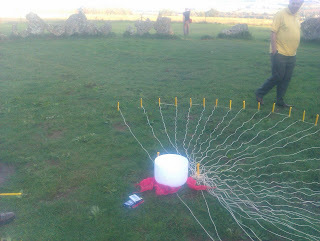 While dowsing with the Archeological dowsers, I learnt a technique which seemed to be similar to Bishops rule. Bishops rule is a technique where you can establish how far down a water vein/line is when dowsing for water, it involves you walking away from the dowsed spot until the rods indicate the depth, upon measuring of course. You literally imagine that you are walking toward the water underneath you, which is a lot easier than it sounds! So I applied the same technique, imagining the outline of the height of the stone being projected out in front. 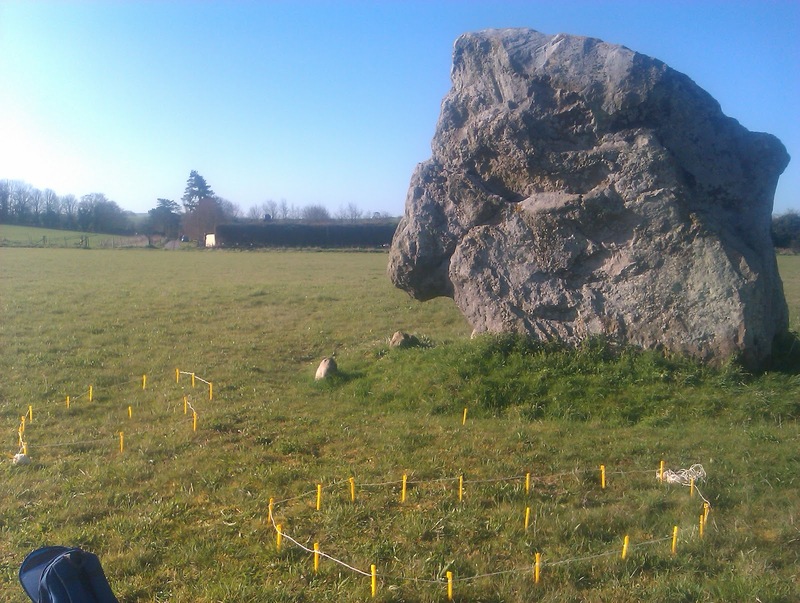 I practiced on the stones that were there, and on measuring them was quite suprised. I also did the same for the depth. With my new found technique I was armed and ready to establish what this cove may have looked like. The first missing stone was dowsed and seemed pretty similar to the already standing stone. 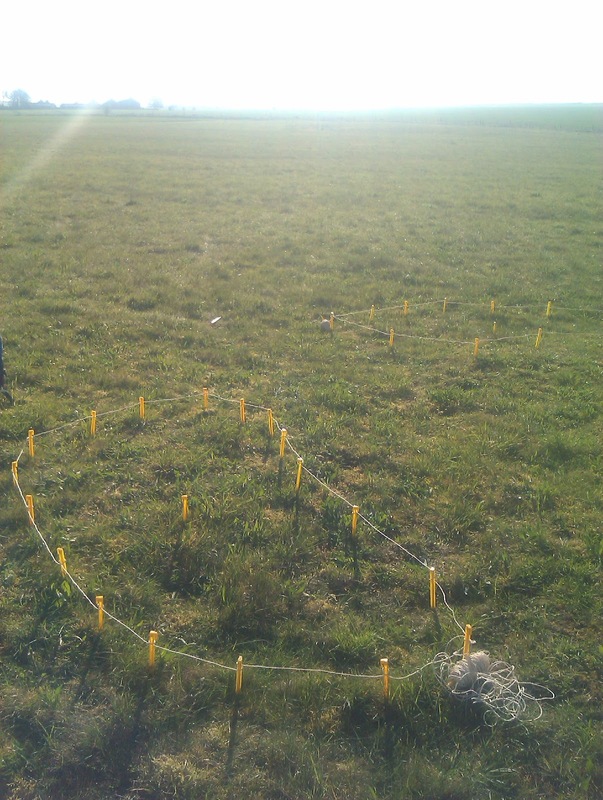 The outline was not predetirmined and if you have dowsed you will understand what I mean, I felt when dowsing that it was far too small, but upon measuring I was suprised. 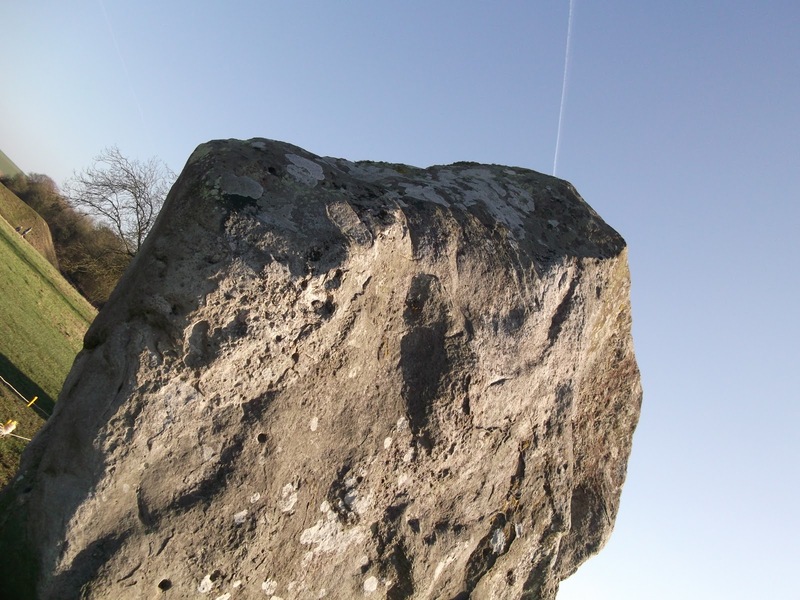 The stone had an odd cut-out similar to Eve and the large stone in the cove at Stanton Drew. The height estimated at 4.5m, which was bigger than Eve. 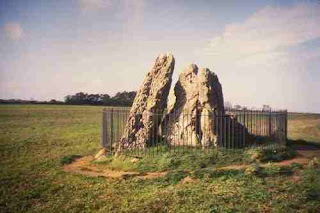 The depth of the stone is estimated to be 3m 22. 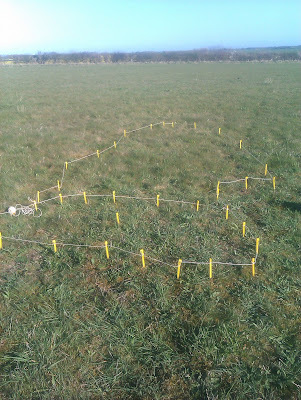 I was quite chuffed with this, although I didnt bring enough pegs so I had to canabalise the other markings! I repeated the process with the other stone, and words cannot describe my shock. This was huge, measuring 8m 80cm. I was in disbelief and really started to question my dowsing, I checked and checked again and got the same result, I also checked the depth which was 5m 30. This is huge! 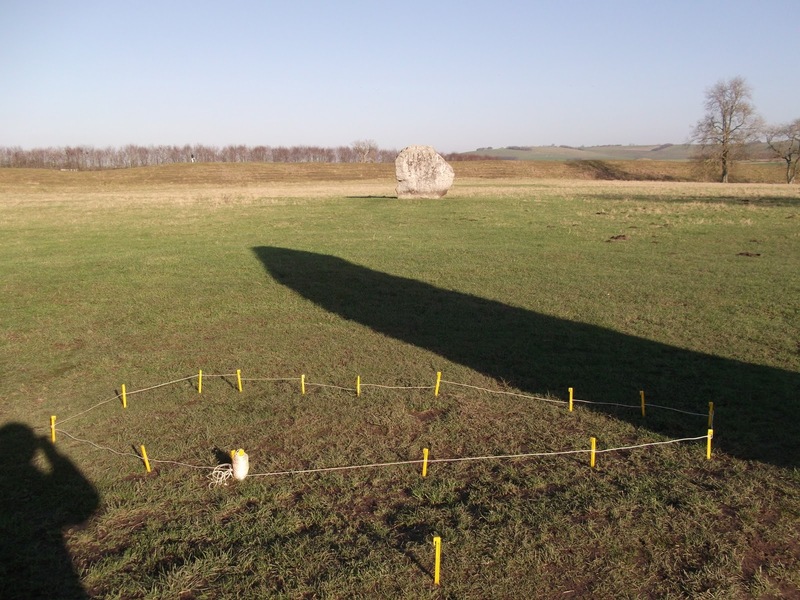 and makes it bigger than the Avebury cove stone, in fact I went to check the obolisk at Avebury which measured at over 9m, and a depth of 5m (very approx). The scientific part was maintaining the data, everything else seemed consistant so I am accepting the results for now, however incredibly controversial! 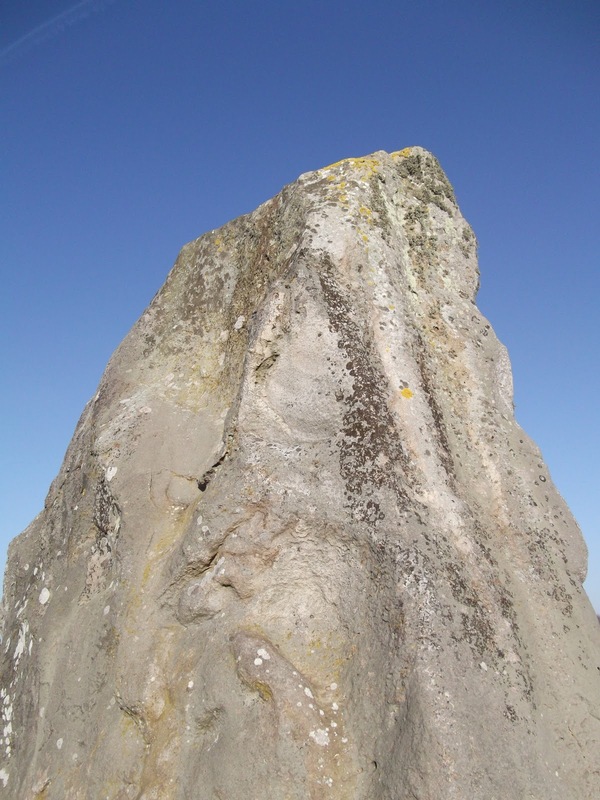 If we assume that the data is correct, then we have a similar set-up to the other cove, a large phallic male stone with a large female stone and a slightly smaller female stone but wider at the base (Eve). The interesting thing also to note is that the cove is not connected to the energy line which runs along the avenue, although there is an energy line which passes through the cove, much smaller at 7 paces. This feeds into the much wider energy line, and there was a dowseable node within this energy. My instinct is that by building a cove here perhaps the ancients were harnessing the energy in some way, and perhaps the energy line would have been a lot wider with the cove intact. 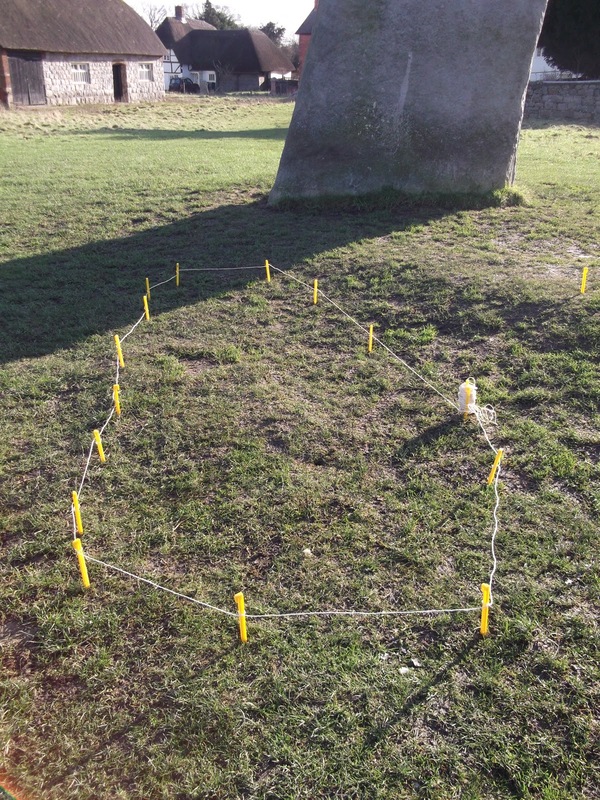 My search for other dowsers to support and check the data still is unanswered, so I am writing an article for "dowsing today" in the hope it may spark some interest. If you are interested in supporting this project then please contact me. For ages I had heard the term "node" being thrown about. I decided to investigate what a node actually was. 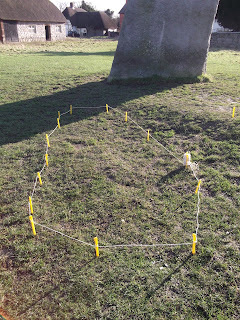 I went back to the St Martha hill woods and picked up on an energy line which I had previously tracked please see "dowsing in surrey" blog set on the right hand side. I tracked it and asked for the node, I had dowsed this node before but only its location, and as far as I knew at the time a node was just were two lines met. 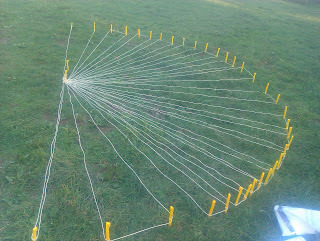 I asked for the energy configuration of the node and I was led in a circle around the center point of the node, on one turning I noticed I was in a different position, and kept going, I was following a spiral slowly getting to the center of the node. I eventually ended up at a point where the rods were pulling on the spot, in other words there was no space left to go so I had reached the center point of the node. I have to be honest, during my research this could well be a purely subliminal invention, spirals are always referenced, but to dowse it yourself is an experience, especially when dowsing this point previously gave a spoke like formation and no spiral, and upon asking for the energy configuration getting a spiral. In itself dowsing a spiral is pretty compelling as it would be very difficult to imagine a spiral and make the rods move in the way that they do on a concious level, again very compelling and in my opinion deviates against the skeptical "ideometer" response as an explanation for dowsing. I checked again for the radials and found them again, so I decided to make a diagram (not at all accurate) that would give you an idea of what a node actually dowses like, also I have to add that this is one nodal point and at sites you often find two next to one another influencing the other, so this diagram is just for representative purposes. I should also add that I have given this a radial count of 34, as that was what was discovered at the rollrights, but this is the only time this mapping has been done by myself, but more research to follow. Interestingly the measurments will need to be taken carefully and compared to the fibonacci ratio to confirm a suspected theory, and assumed by many. 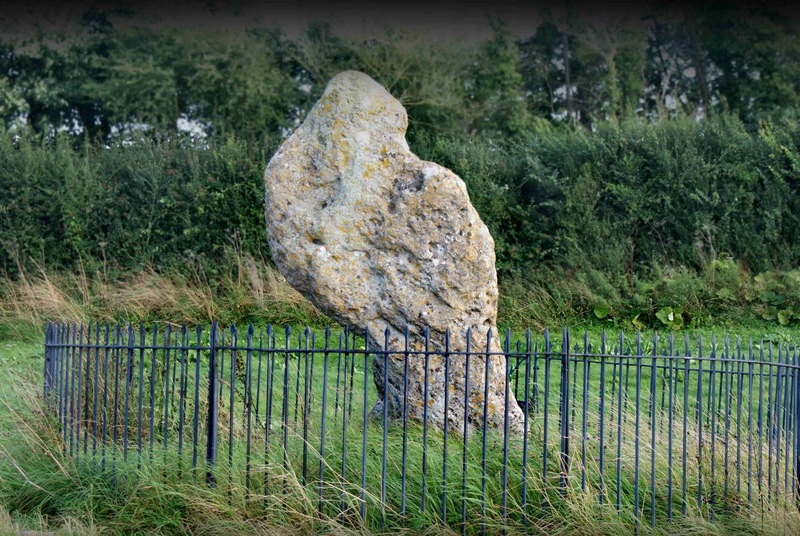 On the research on ancient megaliths, where can one start. 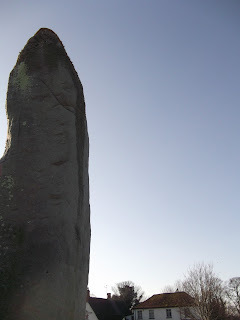 I have no desire to explain Avebury, you can look at this tremendous site which explains it but Avebury can be a great canvas in which to attempt to understand what the ancients may have been intending. What was the purpose of a cove, an opened top structure with gaps between the stones. 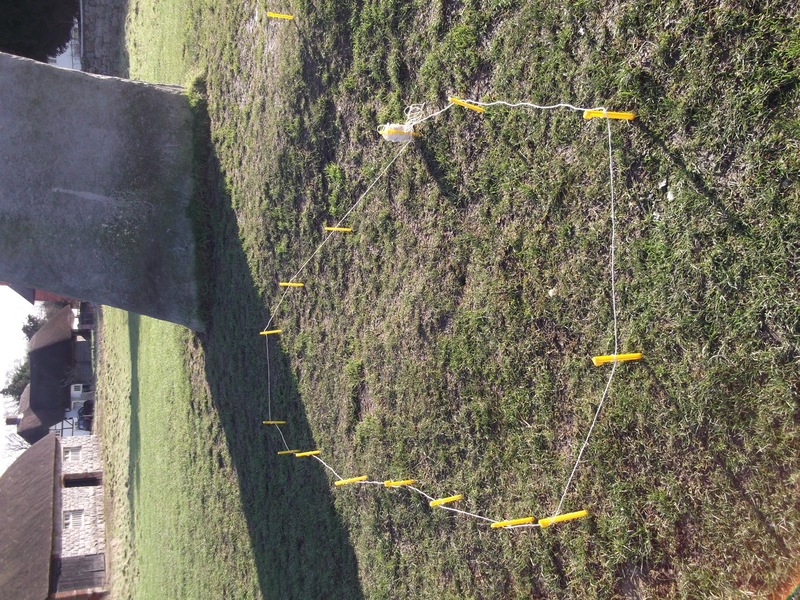 We know that a famous energy line passes through the site at Avebury and at the cove, but was this intended? Or a consequence of the placement of the stones? Difficult to say based on this structure. I felt it might be more provident to establish if there was a third stone and where it was. This would make the missing stone in between the two other stones. The two remaining stones seem to resemble the male (phallic) and the female (octaganal), this is ancient symbology which has evolved into even todays church worship. It was quite busy and didnt get the chance to map out any other energy lines and configurations, but I suspect the energy is being held by the stones, and is directly linked. If this was intentional then one possible idea is that the cove was a focal point of the energies, in the other circle there is a rectangular area marked with an obilisk, perhaps this was a different focal point for a different target. Wide speculation at present and difficualt to proove. 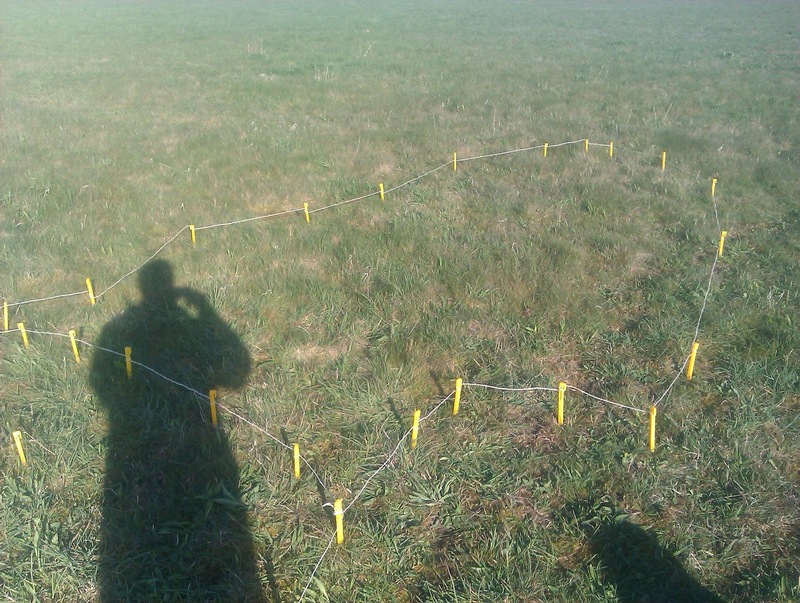 Kevin, introduced me to the complex, and explained that there had also been a cursus found in the field which crop circles had also been found close to. 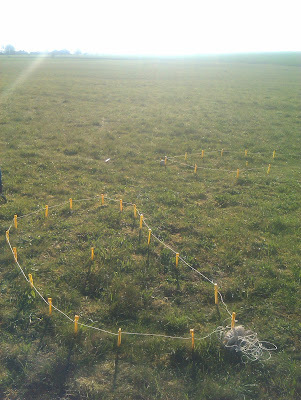 The cursus suddenly stopped and at this point a crop circle had been formed, Kevin also said he was the first one to see the crop circle and that it was a true crop circle. 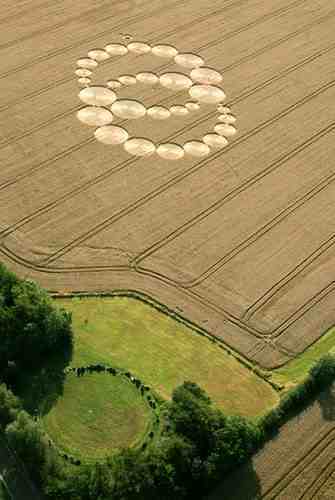 Suprosingly, the crop circle could not be on an energy line such as the belinus or elen, by the geography. 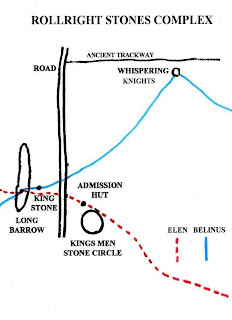 But Kevins theory was related to the flows which ran from the whispering knights, we would investigate this as time continued. This point was a few metres away from the famous point which draws everyones attention. 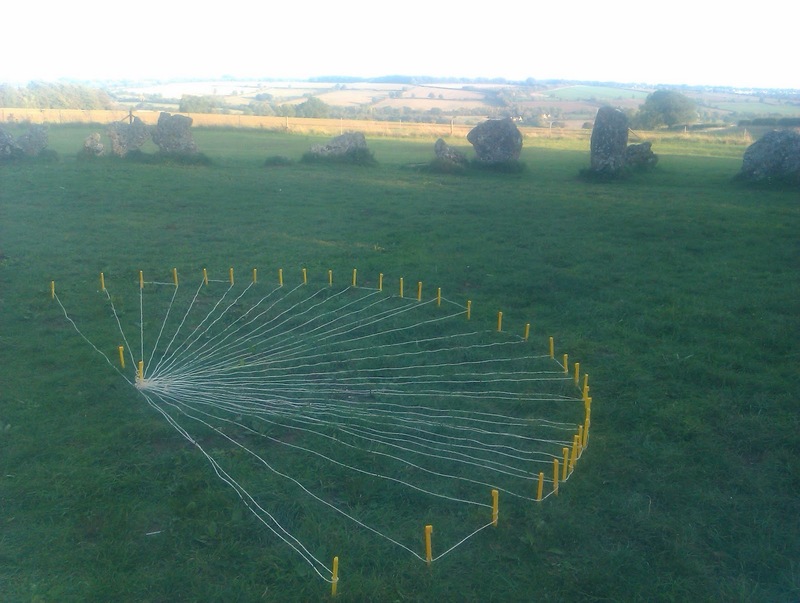 Kevin, has spent much time at this stone circle measuring the geometry, to map the Female magnetic point out, we used pegs and string and only mapped out half of it due to time constraints and lack of string, you have to imagine these lines projecting further. If you see the point above the center of the circle this is the "center" which on measuring we found neither was in the center, and is incidently the male point of the circle, so if you can imagine this cross and another cross with the center above you have a versica piscis. 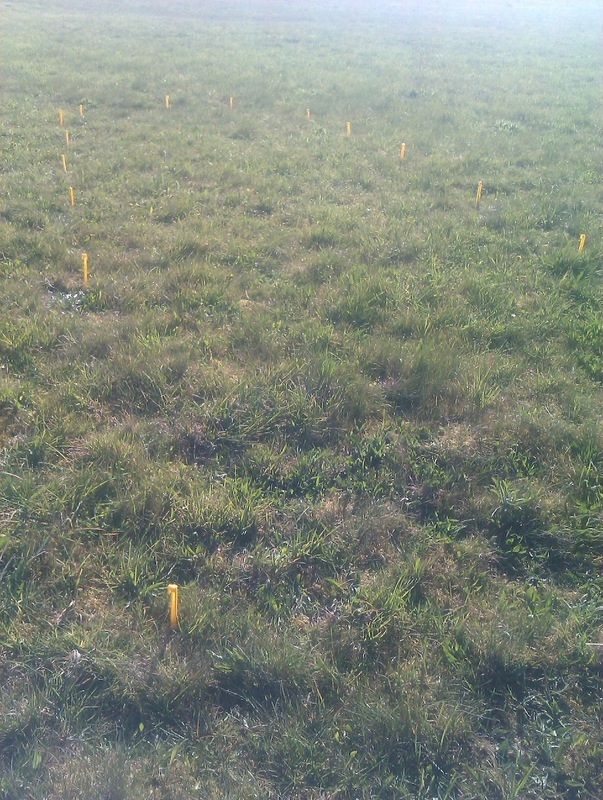 But the aim of this experiment was to find and not speculate. We ran out of time otherwise the others would have been plotted, incidently it would get very complicated. 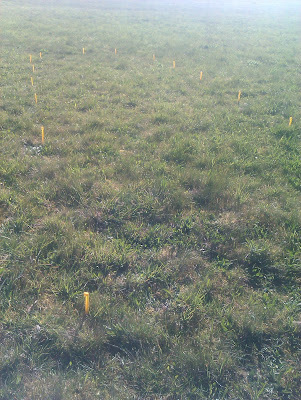 But we will return and report more findings. If you look here the lines varied in space between and it was tricky to dowse each line. 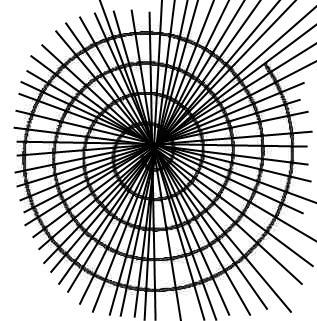 incidently I did wonder after why the lines were so close together and it happened that the sun was shining exactly from the area where the lines were together, this is possibly a coincidence. 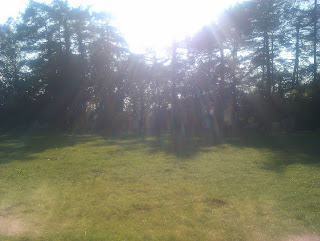 The sun was extremely bright and some interesting charactors turned up during the day, a lady with healing bowls turned up and graciously lit up the place with the resonance of these bowls which was an experience in itself. 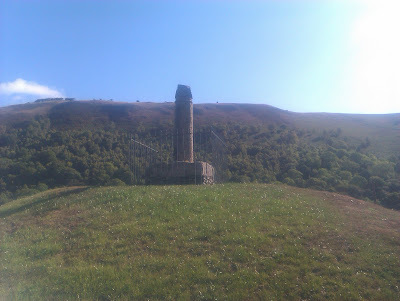 I got there a little early and decided I would check out the 9th century cross located on top of a bronze age tumuli, this had to have energy passing through it! It was early, and the sun was beaming down. 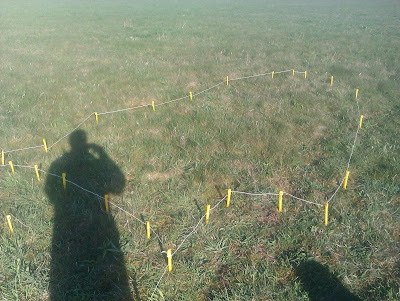 It didnt take long, I found two energy lines crossing at the Tumuli. They were of a similar width, 20 paces and one seemed to be heading for the Abbey, but I tried to forget this preconception as so many in the past had been made prematurely! I asked the spirit of the place where I could sit if I wished to help it, since arbor low my spiritual confidence had improved and I felt a calm response as the rods slowly guided me round. 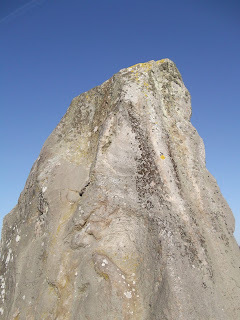 I was led to a spot and I sat, meditating, the sun seemed very bright and I felt very dizzy, I can only explain it as if a channel of energy between the tumuli below me and the sun above me was focussing energy through me like a cylinder around the base of where I was sitting. I concentrated on positive thoughts, this was hard at first but something inside calmed me. I could taste the sun, and it was very metallic! 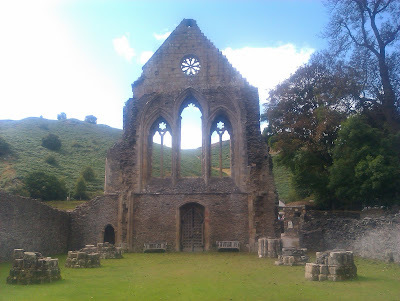 I thanked the spirit of the place and decided to meet with Ian and discover if the abbey would hold secrets! The ruin itself was spectacular, the entry fee was £2.80! Which was cheap by the English heritage standards we had become accustomed to! This would proove useful as it left pocket change for monks chocolate, which I will come back to later! I wandered around the exhibition for a while, I tried some deviceless dowsing around the structure, and found myself feeling energised by the experience, too much so to get a specific reading, however I came across an interesting charactor with a purple dowsing rod, It was Ian. I did some dowsing with Ian, involving water and archeological dowsing, some successfull some not, having said that I seemed to be picking up on more water drains than the one he mentioned, and Ian explained this with different dowsers get different things which I had also heard about. Having said this I felt more confident than ever! I found a small 5-6 pace line running straight along the center of the church and it crossed with another at the altar with another small line. 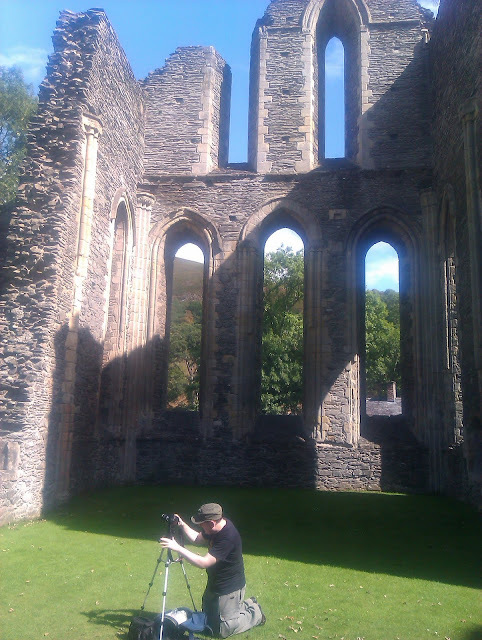 This was very odd, at such a significant Abbey such narrow lines at a geometric precision with the Abbey itself. I had some ideas about this but it was time for some lunch. After a lovely lunch at a pub in the town of llangollen, The Bridge End. Ian knows the place well because of their fabulously hot Chilli con Carne, unfortunatley on this day Sunday lunch had taken over the menu so a Turkey and ham bagette had to suffice!. Ian then took me on a fascinating tour around the free museam, where I learnt about the music festival that enticed musical groups from around the world! She had marked out some chakra hotspots and another energy line running near to mine exactly parallel, and where my line was she had clearly marked hotspots in a straight line exactly where my line was, she had also marked out similar lines next to this in a third line. I was intrigued and realising I had not dowsed this area realised I should! Low and behold this is what I found and as I called out to Ian, he turned grinned at me and said "triplets", I was bemused... as if dowsing was not complicated enough, three lines or bands of energy narrower than a normal energy line. This energy seemed very straight in nature and the fact it shadowed the abbey architecture was most perculiar. At that point Vivian who we spoke of earlier returned to look for her glasses, she explained the bands as being a part of a bigger energy line, each mini line or band as it were alternated positive and negative. This was beyond my understanding and I had not come accross this before and I wondered why this site had a variance than the others I had visited. 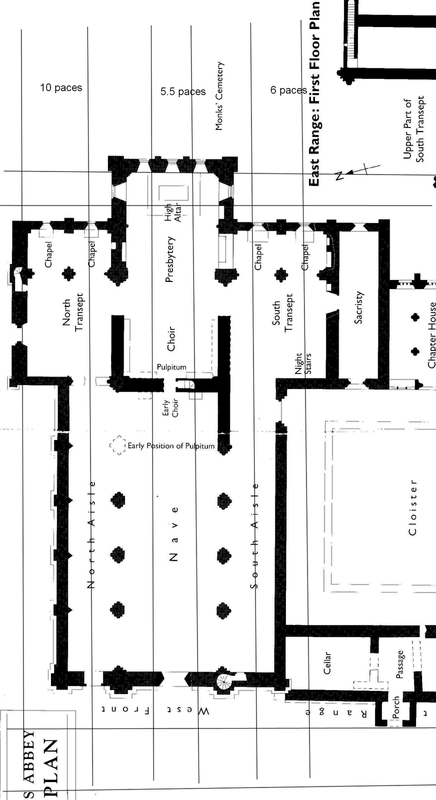 The only one I could compare it to was Salisbury catherdral in the fact the builders were very aware of these lines or more probable the layout of the structure had somehow affected the lines. 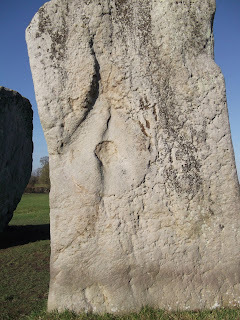 Ian agreed and said he often found at sites this happened, energy almost squeezing itself to fit through a doorway, I suspected that the materials may have had an influence, but I would have to look very closely at ancient sites in the future. 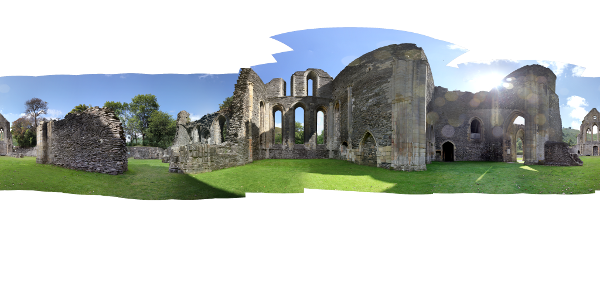 Having dowsed the outside of the site I was getting basically the same thing but I was also getting interference so I returned to find Ian in full swing of taking a panorama shot of the Abbey. Overall a fantastic day with some good insight, education and confidence building... but alas It was time to go.